Reading is very important to a child’s development. From recognition skills as they look at a picture book to learning the words to read, developing imagination, increasing vocabulary, learning better communication skills, doing better academically, the list goes on and on. Infants are just learning about the world. They only know what you teach them. As they become more alert they are learning and absorbing all that is going around them. Placing a book in front of them will encourage them to pick it up, look at the pictures, touch it….. opening up their minds to what the possibilities are. 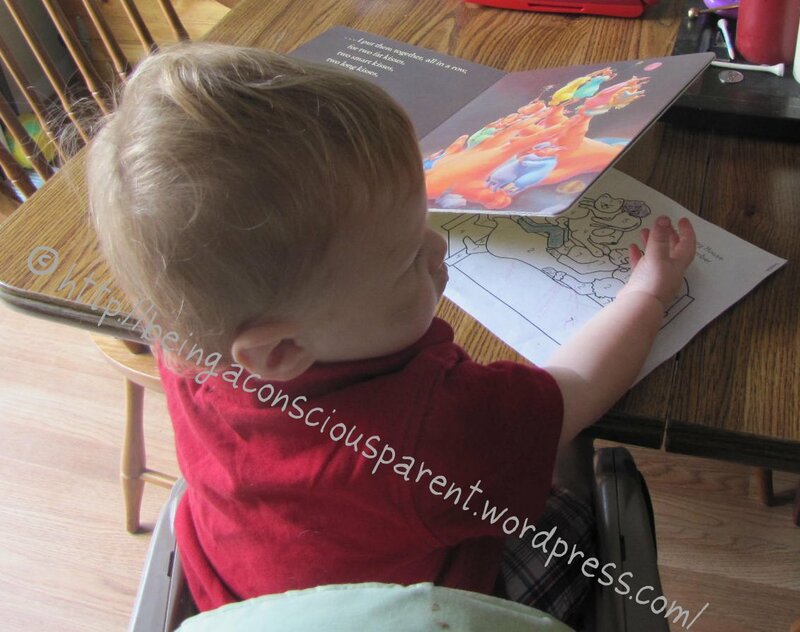 Picture board books engage several of the senses – visual, tactile and auditory if they’re being read to. Toddlers are learning about the world a mile a minute. You can show them to do something one time and they have it mastered! Reading aloud to them helps them associate words with pictures. This improves their language and communication skills. It introduces them to a world outside of their home. Children have such an imagination. Have you ever watched a group of children play “hot lava” on the playground? Where do they get that imagination from? All over. 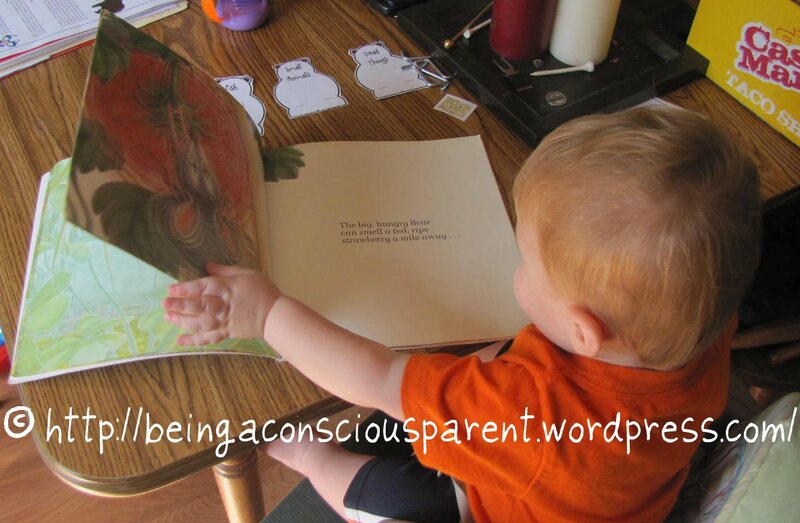 Books expand your child’s experiences of new places, people, and things. It gives children the opportunity to discover a topic they are interested in. Reading aloud to them helps them develop good listening skills, comprehension skills, and language skills. Reading with your children encourages a special bond. It is quality one-on-one time and gives you and your child the opportunity to learn together while snuggling! Reading opens the doors to all other possibilities! Encourage your children to read from a very early age. Here is my experiences with reading. Virtual Book Club for Kids- October! As we participated in the Summer Virtual Book Club, we are continuing it throughout the year. 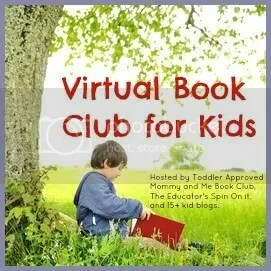 The Virtual Book Club is being hosted by Toddler Approved, Mommy & Me Book Club, and The Educators spin on it. Here is more information on joining. Please join us with this fun adventure! You can find out the other authors here. Find out who else is participating here. To find out what are plan is for this tot school year go here. Virtual Book Club is on Facebook and on Pinterest! Year-Long Virtual Book Club for Kids! 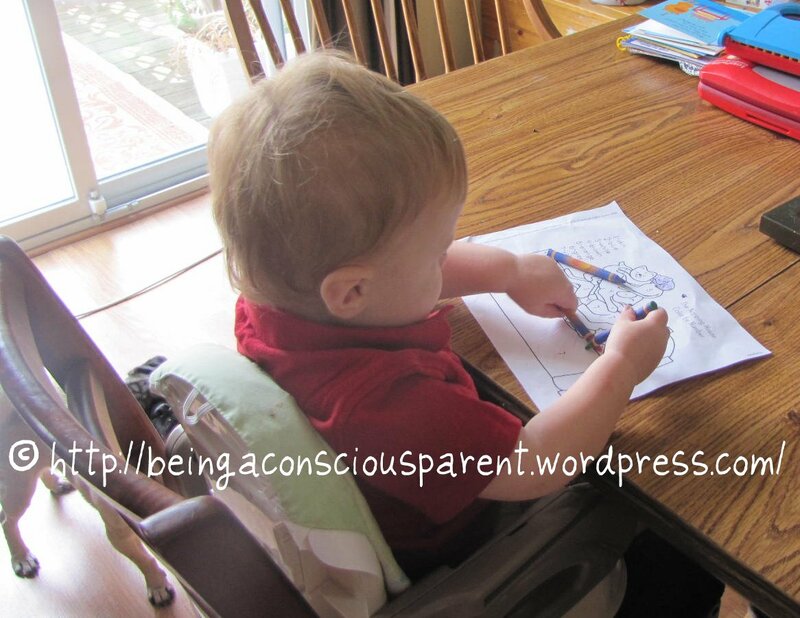 Toddler Approved has all the information to join up! Feel free to join us! Please join us with this fun adventure! To find out what are plan is for this tot school year go here. For the month of July, we studied one of my favorite authors Audrey and Don Wood. We read a ton of their books! RC loves to read. He enjoyed “reading” this story after Daddy read it to him. 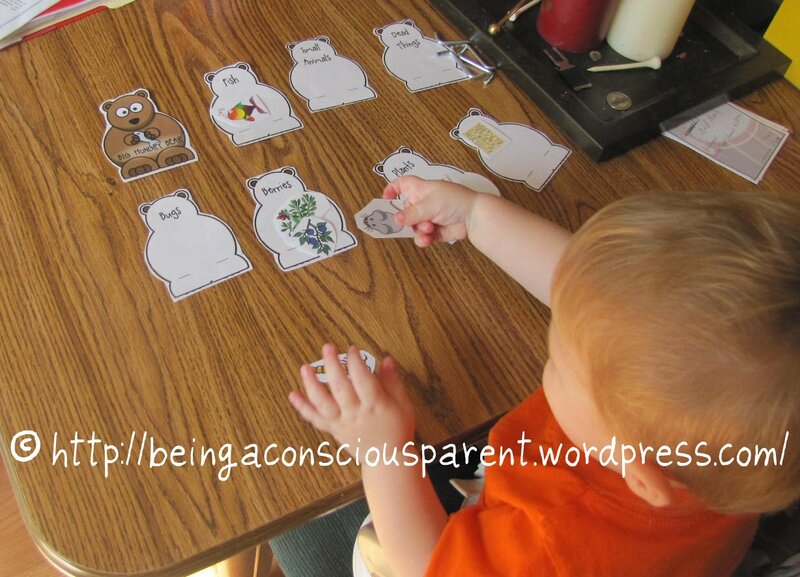 What did the Bear eat activity. RC did alright with this one. He is still a little young, but he had fun playing with the cards. He did start to get the hang of what pictures went with what words. We did finger play activities with the books Piggies and Piggy Pie. There are a ton of different activities that we did for different books! Here are a few that we used! Audrey Wood has a few activities on her blog. For the month of June the Summer Virtual Book Club is all about the author Mo Willems. This past week we started with Hooray for Amanda & Her Alligator! , and Knuffle Bunny Too: A Case of Mistaken Identity . We also had fun with a few activities to go with both books. I was also able to pick up the movie Knuffle Bunny Too from the library. My son had such a blast with those two books that during our weekly trip to the library we picked up Cat the Cat, Who Is That? , Don’t Let the Pigeon Drive the Bus! , The Pigeon Finds a Hot Dog! , The Pigeon Wants a Puppy , and Naked Mole Rat Gets Dressed . I do have to say that my personal favorite is Cat the Cat, Who Is That? . I think that the book is perfect for young readers learning and short enough that it holds my son’s attention. The first book was Hooray for Amanda & Her Alligator! . Since the book was about friends this day we had RC’s 2 best friends over for a playdate. One only made it through the activities as the other went down for a nap! They both had a blast playing with shaving cream! This is a great sensory activity. You can do this on paper, in a tray, or like we did on the floor. Since they were on the floor they both got pretty messy, but it was easy clean up with a quick bath! They also colored pictures of Amanda, Bear, and alligator. We created our own types of thinking caps and tried to find different ways to surprise each other! Over all it was a very fun-filled day. RC is teething and just enjoyed a day of relaxation. Here he is watching Knuffle Bunny Too! We watched it with the captions and without. It was nice to see this book come to life. RC loves his 2 dogs. Here is RC playing with Cin out in the yard. The other side of our yard has mint growing, the dogs like to eat it, I caught RC picking the leaves off and feeding it to Cin. Personally I think that RC favorite thing was to actually read the books. He loves to look at the pages and listen to someone read to him. Feel Free to Join us in the Summer Virtual Book Club! I am so excited that for the month of July the author is Don and Audrey Wood. They are one of my favorite authors from when I was a child. I still to the day love to read their books! We have a few in our library at home and this gives me an excuse to pick up more! I will post the books and activities to go with the books on July 18th. Please check back then as to the fun activities we have planned. If you would like to join the Summer Virtual Book Club, we would love to have you! Virtual Book Club for Kids! Looking for new and interesting activities to do with my son during the summer, I stumbled upon a Mommy and Me Book Club blog. 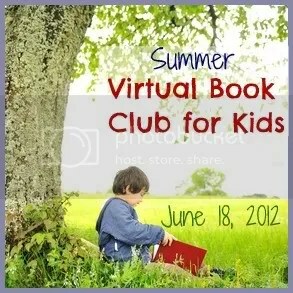 I noticed that she is hosting a summer virtual book club for kids! I got excited! I love to read and my son loves books, so this would be great. Plus it will expose both of us to new books and authors. So for the summer my son and I are going to be participating in her virtual book club. Please join me and check out her blog for more details. I will be posting on the particular day she has set up for each month! I am really excited to be apart of this! Do you have any fun activities you are doing for the summer? Please share! Educational Tool: Goodnight Moon Printable Pack! Do you have any fun educational tools? Please Share! My son is getting to be of the age where he is starting to learn different things. I noticed this and wanted to capitalize on it, but I didn’t know where to start. 1+1+1=1 blog has a weekly link up to her tot school. She has tons of ideas on how to teach your children at home with the things that you already have at home! We are now working on our colors. We work with different flash cards and use books to pick out colors. Now that the weather is nice we are incorporating time outside to burn some energy. 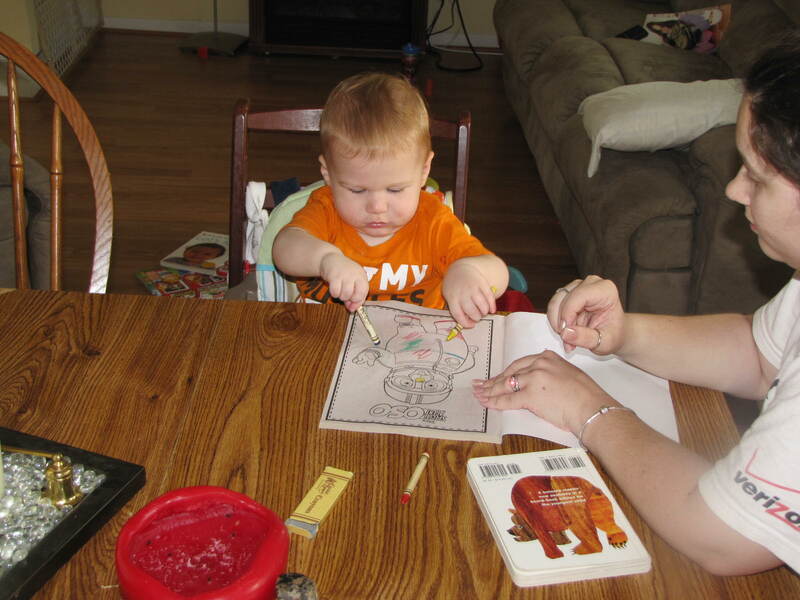 RC is learning how to hold a crayon. 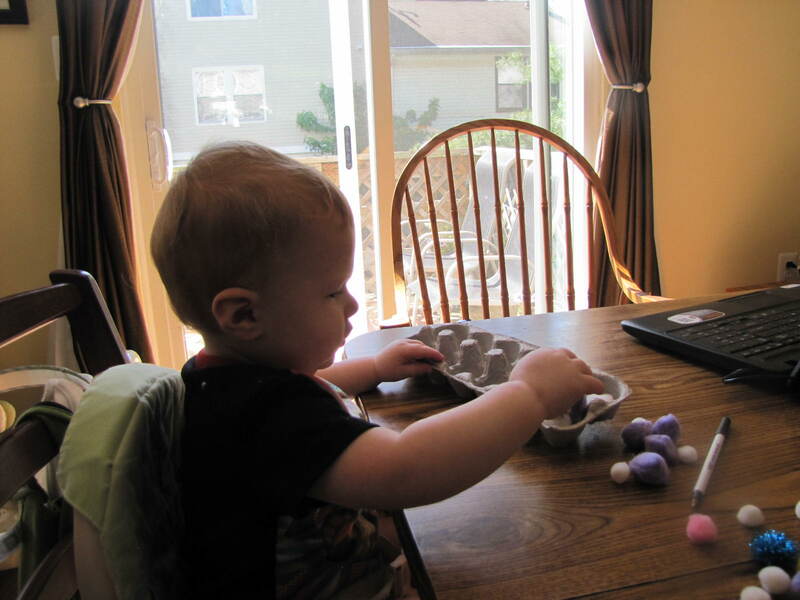 Working on the fine motor skills, I got some pom poms and an egg carton. He had so much fun putting the pom poms in the egg carton. 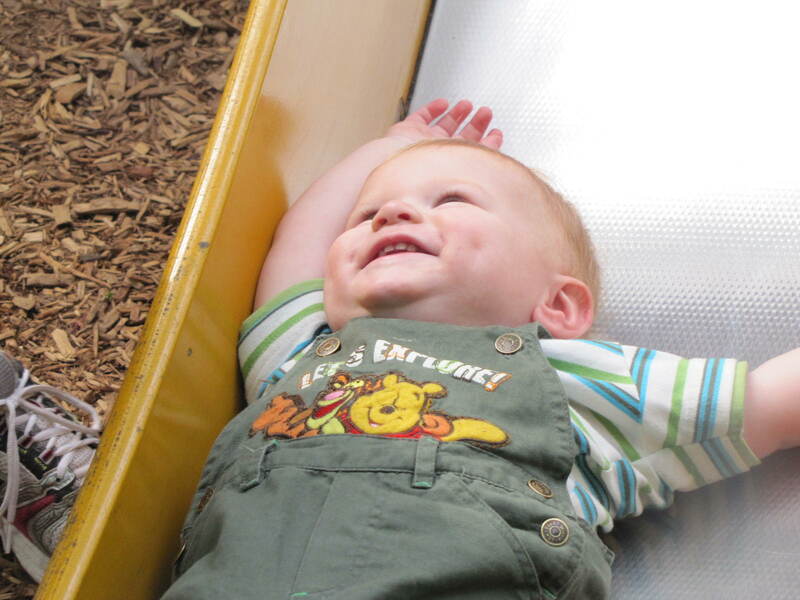 RC had so much fun at the park going down the slide all by himself! Do you have any suggestions on learning tools to teach my son? Please let me know! Do you have any fun printables for children? Please share!